Hewlett-Packard has convened a meeting of securities analysts in San Francisco at which CEO Meg Whitman is expected to give the latest look ahead at how she plans to turn the company around. As shareholders, employees and customers know all too well, there are many things that need fixing, and the fact that the share price has recently been trading no higher than where it was in 2002 is about as strong an indication of that as you can get. Whitman has several items on the agenda about which analysts will be expecting to hear: Rationalizing her decision to keep the PC business, entering the mobile device business again after bailing out of the webOS hardware business, fixing the IT services unit on which the company took an enormous write-down recently, and growing the software business are but a few. But the big item will be financial guidance for the coming year. The proceedings are about to begin. 8:16 am: The program is getting under way with introductions. It will be Cathie Lesjak who gives the much-anticipated financial guidance, and she will speak after Meg. Right now, Rob Binns is giving an introduction and reading the safe-harbor statement. Riveting. Whitman: Our goal today is to be pretty straightforward. We want you to understand the journey that we’re on to turn around one of the world’s great technology franchises. Whitman: When I became CEO, it was a turbulent time for HP. Since then, I’ve seen the company’s strengths. Customers and partners want HP to win. One important strength is global reach. We can reach any corner of the globe. One of the things I heard we were short of on HP is innovation. My conclusion is not that we don’t have enough ideas and innovation. It’s that we don’t work hard enough to get those ideas into the marketplace. Whitman: In the last decade, HP has made a remarkable transformation from a printing company to a diversified IT company. Whitman: The good news is that we are No. 1 or 2 in each of the major markets, and we can leverage that position in areas like supply chain and distribution. Whitman: HP has a well-known and trusted brand. We also have a talented, committed and, I would say, resilient workforce. We will do anything for customers. They are at the heart of the company and have been for 75 years. In 2002, HP was a printing company with 95 percent of profits coming from printing. Carly Fiorina and Mark Hurd assembled a powerful set of businesses. From 2010, HP has seen a multi-quarter decline in revenue and margins. 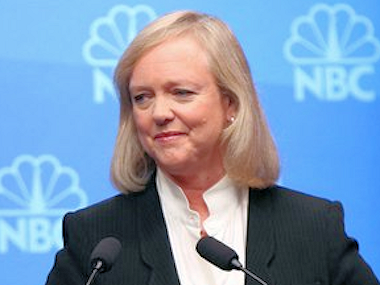 Whitman: My belief is that the single biggest challenge at HP is the changes in the CEOs. There have been multiple inconsistent plans and executional miscues limiting the speed of recovery. 8:27 am: EDS has had four different leaders in only a few years. All of this is fixable, and it is going to take some time. In basic execution, HP has challenges. We don’t have the sharp competitive focus we’re going to use. HP also has too many areas of focus, whether it’s products or geographies. 8:28 am: Whitman: Expect the number of printer SKUs to be cut by 50 percent next year. Todd Bradley, the EVP who runs PCs and printers, was surprised to learn that HP makes 2,100 different printers. Whitman: Marketing hasn’t been centralized; different units have been spending money inconsistently. Now she’s talking about compensation. I’ve learned, at HP, you don’t get what you expect, you get what you inspect. Whitman: It has been over seven years since we’ve had a new lineup of multifunction printers, but we have a much smaller share than we should in this market. We are not as competitive as we need to be in how we go to market. Also good news for Workday — HP is a customer. Whitman: HP faces dynamic market trends that we must confront. Mobility, software as a service, the cloud, hyperscaling. Whitman: We also face very aggressive competitors. We have to demonstrate a will to win. We face some real macroeconomic headwinds. SMB and enterprise demand in Europe is very weak. Consumers are spending less, and there’s no question that China is slowing down. Whitman: I will characterize fiscal year 2012 as diagnosing the problem and laying foundations for the turnaround. In 2012, the priority was to stabilize the company. 8:34 am: We have more work to do, but I think we have made good progress. Whitman: Peeling the onion has taken some time. I’ve made several organizational and leadership changes that will help HP navigate the trends better. Whitman: We now have crisp, agreed-upon strategies across the business units. Whitman: We’ve also renewed HP’s focus on products and services. Meg is about to run down the next four fiscal years. We’ve just completed Year One. 2013 will be a fix-and-rebuild year, and we’ll be doing it in a worse macroeconomic environment. The good news in 2013 is that the bulk of the profit decline will be in enterprise services. Whitman: I believe that 2014 will be the year you see real recovery and expansion at HP. You should see every business unit recover and grow. Our investments in R&D and IT will begin to kick in. And we will have demonstrated an ability to manage costs in line with revenue. More debt will be paid down. Whitman: 2015 will accelerate. We should see a vastly reduced number of SKUs and platforms, and this should reduce costs. Whitman: Compensation will be aligned to business outcomes and metrics. By 2016, we should have achieved market leadership in many areas. Financial metric should be growing about as fast as GDP, and profit should be growing faster than revenue. 8:40 am: Whitman: I now see, up close and personal, the challenges we face. There are no silver bullets. We will solve our problems through consistent leadership. Whitman: Now she’s going to run down what role each business unit is going to play, going forward. Whitman: The core of the company is infrastructure and hardware. They represent 70 percent of revenue, and it’s something we do better than anyone else, and it’s the DNA of the company. We need to stand up and be proud of it. People say it will be a commodity business. I say, not if we can help it. 8:44 am: Three big themes going forward: Cloud, Security, Information. Whitman: Now she’s diving into the enterprise services business. She expects a decline in services revenue, with slowly improving margins. Whitman: Now to PCs and printing: $65 billion, which would make it a Fortune 50 in its own right. PPS will be a low-growth business. She’s praising Todd Bradley, who took PCs from a money-losing business to being the biggest PC maker in the world. Whitman: The enterprise group is a moderate growth business with the potential for faster growth over time. This business has an excellent set of assets. 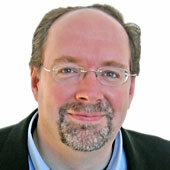 Whitman: 2013 will be the year that Technology Services gets integrated into the Enterprise group. Whitman: Now she’s describing the software unit. 8:50 am: Whitman: For services, you’ll see we have an entirely different operating model for 2013. The revenue has been disconnected from the people who own them. For 2013, we are restoring revenue and profit responsibility to the managers of our top 200 accounts. Whitman: For PPS, we’re closing the product gaps that have hurt PCs and printers. We’re innovating and betting big on the ink business. Whitman: In enterprise, it’s all about innovation and the journey to the cloud. For software, it’s about getting all the consumption models brought about by the shift to the cloud. Whitman: Today, the architectural advances in enterprise hardware make it hard to justify the premiums in products from the likes of EMC and Cisco. Whitman: 3Par and StorOnce are big offerings in data storage. Whitman is running down several products that she says are showing promise in the marketplace. Storage, networking, multifunction printers, ArcSight, Autonomy, Vertica. Just looked at HP shares: They’re down more than 5 percent while Meg has been speaking. Now at $16.18, down 95 cents. Whitman is pretty close to wrapping up, which means that CFO Cathie Lesjak will be up with the guidance momentarily. Whitman: I believe, with every single bone in my body, if we do this right, we can set HP up to be an unrivaled leader for the next 75 years. 9:02 am: And here’s Cathie Lesjak. Lesjak: Fiscal 2013 is going to be another challenging year for HP. Lesjak: We have seen deteriorating market conditions and execution that is not up to our standards. Lesjak: In the first quarter, we saw a dip in cash flow, quarter on quarter. We have begun to address these with leadership changes, but there’s a lot more work to do. We’ve had discipline in the capital allocation progress. Lesjak: Technology services will become part of ESSN in fiscal 2013. We are doing this to more appropriately align how we manage them. Lesjak: We have generated $4 billion in free cash flow. At an operating company level, our net debt has improved by $2.5 billion this year. We increased dividend by 10 percent, and bought back $1.3 billion worth of shares. Lesjak: I know capital allocation is top of mind for all of you, so I want to walk you through how we invest your money. Lesjak: Every business unit has differing levels of variable costs. PSG has sort of a sliding cost structure, but still manages to maintain its operating margins. Lesjak: In May of this year, we adopted a multiyear restructuring plan. We are increasing R&D costs in FY 2013. Lesjak: We expect $1.5 billion in restructuring in FY 2013. We expect 26,000 people to leave the company as part of the restructuring. Expect $2.7 billion more in restructuring costs. Lesjak: Must of the operational savings will be needed to offset the economic headwinds. 9:09 am: Lesjak: Our main priority is to deploy the appropriate mix of capital to the most productive uses. Lesjak: Getting back to a mid-single-A credit rating is a top priority. Lesjak: We need to reduce our net debt position on the operating company to near-zero. Meanwhile, HP shares are down 6 percent. Looks like it has touched a new 52-week low of $15.93 today. 9:13 am: Lesjak: Now looking at the progress in rebuilding the balance sheet. Our net debt position is below where a mid-single-A company should be. It will be a couple years before we are where we need to be. 9:15 am: Here comes the outlook. Lesjak: We expect continued weakness in the macroeconomic environment. We expect year-on-year revenue declines in all segments except software. Lesjak: FY 2013 outlook: Non-GAAP EPS $3.40-$3.60. There goes the $4 that analysts had been looking for. This is based on an assumption that Enterprise Services Business Revenue will decline 11 percent to 13 percent across the company. With operating margins of zero to 3 percent. That’s pretty huge. And now HP shares are nearing a 7 percent drop. Lesjak: We continue to expect continued weakness in Business Critical Systems. Lesjak just ran through a slide showing where HP expects different business units to contribute to the declines. Enterprise Services will see declines of 29 cents to 35 cents a share, the Enterprise Group will see declines of five cents to 12 cents. Software will contribute one cent to three cents per share in growth. PSG, the PC group, will be flat to slightly down by one cent. IPG, a.k.a. Printers, will grow by five cents to eight cents. Lesjak: Let’s look beyond fiscal 2013. We expect to be a GDP growth company with key segments that grow faster than that. That, combined with growth in software, will grow our top line. 9:27 am: And Lesjak is done speaking. I’m going to close out the liveblog here.